BANFF, ALBERTA, Canada – If you’re looking for an adventure in Banff, Canada, you can’t do much better than the Columbia Icefield Glacier Adventure! This Canadian Rockies activity takes tourists on a trek over the surface of the Athabasca Glacier. With ice explorers especially trained for glacial travel, this Banff, Alberta destination is one you won’t want to miss! Each 80 minute journey is lead by an experienced driver-guide, who shares a wealth of fascinating information about glaciers, icefields and their impact on our environment. Mid-point in the tour, passengers can safely step out onto the glacier and stand on this powerful ancient ice. Tours depart every 15-30 minutes from the Icefield Centre on the Icefields Parkway. Facing the Columbia Icefield Visitors’ Centre lies the Athabasca Glacier – a tongue of ice 6 kilometres long and one kilometre wide. Take time for Brewster’s “Ice Age Adventure”, a tour onto the icy slopes of the Athabasca Glacier. 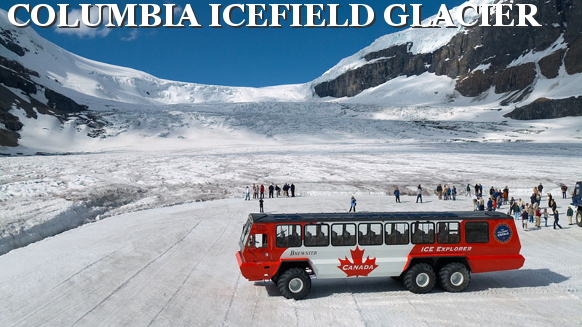 You will travel in a specially designed Ice Explorer to the middle of the glacier, on a 5 kilometre round trip journey. Your driver/guide will explain how glaciers are formed and point out interesting geological features as you travel in safety and comfort. At the mid-point, you will have the option of stepping out onto ice formed from snow falling as long as 400 years ago. For a trip through time and a great way to experience the Canadian Rockies, make sure that the Columbia Ice Field Glacier Adventure is on your list of things to do in Banff, Alberta! While exploring the icefield, take care not to walk on the glacier; glacial ice is slick, and falling into a crevasse is a possible danger. Remember to dress appropriately for the trip!